YANGON – The Yangon regional government and South Korea-based Myanmar Company Wooree signed a memorandum of understanding for the Dala Industrial Development Project on Saturday, a project to be implemented on the west bank of Yangon River near the ongoing Yangon-Dala bridge project in one of Yangon’s undeveloped townships according to the Yangon regional government. The Yangon government has not announced details of the Dala Industrial Development Project or estimations of cost. Yangon’s Chief Minister U Phyo Min Thein said the bridge will benefit the industrial development project and will also support Yangon Region’s economic development. The industrial development project will be a part of the Yangon-Dala bridge project which is a friendship bridge between Myanmar and South Korea. The bridge project will begin in September this year and is expect to be completed during the 2020-2021 fiscal year. The Yangon-Dala bridge project agreement was reached under then-president Thein Sein’s government and is expected to cost $137.8 million in loans from South Korea’s Economic Development Cooperation Fund with the Myanmar government promising to provide an additional $30.3 million. The bridge will connect Phone Gyi Street in downtown Yangon with Bo Min Yaung Street in Dala Township. During a recent Yangon regional parliament session, the regional government proposed a project called “Yangon Regional Economic Development” to be implemented in 11 townships across Yangon Region, however the proposal was not approved due to a lack of details. According to a Dala lawmaker, Dala Township is included in the townships proposed in the project. “I guess that the Yangon government will present the MoU and more details about the project in the coming parliament [session],” U Tun Yin, a lawmaker in Dala Township told the Irrawaddy. “They need parliament approval. They can’t implement the project if we don’t agree,” he said. The parliament will need to determine how the company will pay compensation to the land owners in the project area where there are many different forms of land ownership including paddy fields and residential quarters. The parliament can approve the project after lawmakers testify the potential benefits and challenges of the project, U Tun Yin added. Lawmakers expect that the industrial development project will begin before the bridge project is complete and that an estimated 1,500 acres will be needed. “We won’t reject the project, if [it] will give job opportunities to the local people,” U Tun Yin said. According to a post on the official Yangon Regional Government’s Facebook page, Union Minister for Commerce U Than Myint, Yangon Region Chief Minister U Phyo Min Thein and regional government officials attended the MoU signing ceremony as government representatives. Dala Township is one of the city’s most underdeveloped townships and is currently accessed from downtown Yangon only via a public ferry. In contrast to the nearby downtown Yangon area, it is populated with old wooden fishing boats, small houses and squatter huts. During summer, water can be scarce and many people lack access to clean water. It is difficult to cross the river during the monsoon season when local residents use small ferries to access downtown Yangon with a number of deaths due to ferry accidents every year. 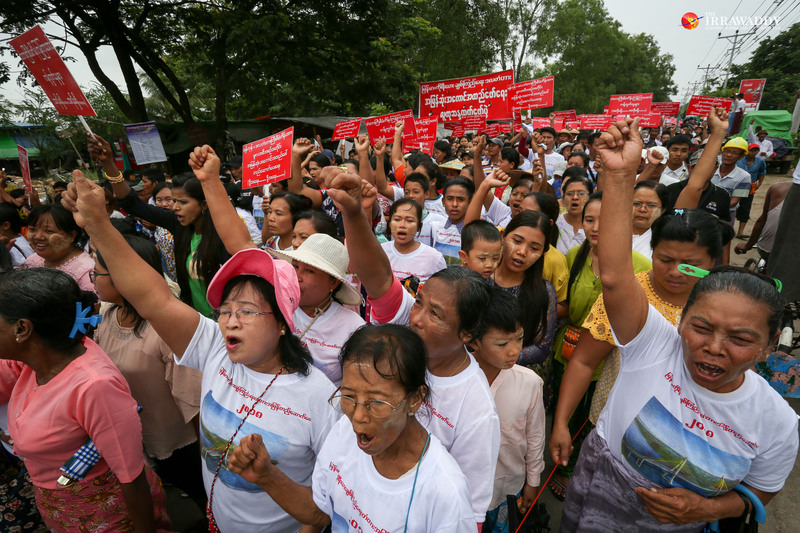 In June, more than 1,000 residents from Dala, Kawhmu and Kungyangon townships in Yangon were joined by residents of Ayeyarwady Region in a protest calling for the rapid implementation of the Yangon-Dala bridge in order to avoid more ferry accidents.